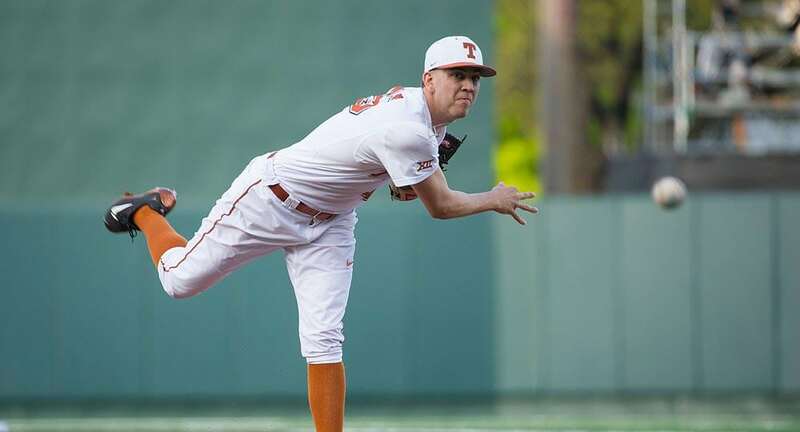 Starter Nolan Kingham gave up nine hits and five earned runs over five innings as the Texas baseball team fell, 11-5, to Arkansas in the first game for each team in the 2018 College World Series (photo courtesy of texassports.com). OMAHA, Neb. — A close game got out of hand in a hurry after a nearly three-hour rain delay, and the Longhorns couldn’t turn their fortunes around in time as Arkansas took an 11-5 win Sunday in Omaha. Texas will face Florida at 1 p.m. Tuesday, after the Gators lost, 6-3, Sunday night to Texas Tech.